If I wrote a wish list for what I’d like in my dream car, I’d put the following on the list: plenty of room for the family and gear, safe, good looks, good acceleration for overtaking, four wheel drive capacity and decent ground clearance for going on expeditions, plenty of oomph for towing, comfortable to ride in, good speaker system and some nice bells and whistles. Well, I’m delighted to learn that the Audi Q7 has all of these. First of all: the looks. 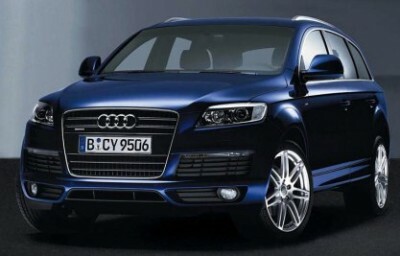 The 2013 Audi Q7 is an SUV that’s stylish enough to turn the heads even of those who aren’t very interested in motors. Seven-hole design alloy wheels and a high-gloss exterior enhance the superb lines of the Audi Q7. The good looks continue inside the vehicle, with cricket leather upholstery beautifully complemented by marlin silver aluminium trim – the multifunction leather covered four spoke steering wheel blends in nicely, too. Plenty of room for the family? Yes – the Audi Q7’s got seating for five, and six and seven seaters are available as options. If you review the boot, you’ll find it’s almost big enough to sleep in, and the rear seats fold to give even more room. The luggage compartment in the Audi Q7 also comes with a partition net and luggage cover, and there’s an underfloor storage compartment as well – with a removable drip tray if the spare wheel is a space saver (not for me – I’d go for the full sized spare tyre). Cup and bottle holders are all there too – handy for a quick cappuccino on the road. If I’m going to put my family into the Audi Q7, I’d like to know that they’re safe. Yes again – the Audi Q7 has a grand total of eight airbags, including a sideguard head airbag system. The Audi Q7 is designed to be stable and has an impressive list of features contributing to its ESP (electronic stabilisation program), which comes with extended on road and off road functions: ABS, EBD, ASR and EDL systems are all networked, and a Roll Stability Program and panic brake assist with brake prefill function are all there. And a handy warning triangle and first aid kit in emergencies. Good acceleration and oomph for towing? Once again, the Audi Q7 gets two big ticks (and towbar preparation comes as standard on the 4.2 version. The Audi Q7 can tow up to a fat 3500 kg). Starting from a standstill, the Audi Q7 hustles up to 100 km/hr in 9.1 seconds if it’s the 3.0 TDI version with a V6 motor, or guns it in 7.4 seconds if it’s the 4.2 FSI with a V8 petrol engine under the bonnet. The 3.0 turbo diesel has got the oomph I want, putting out 171 kW of power at 4000 rpm and 500 Nm of torque at 1750-2750 rpm. And as for the 4.2 FSI, “oomph” is too poor a word to describe the 257 kW of power at 6800 rpm, although the torque is lower than the 3.0’s at 440 Nm at 3500 rpm. There are two other versions of the Audi Q7: the 3.6 FSI (V6 petrol) and the 4.2 TDI (V8 diesel), which has a V8 motor capable of giving 240 kW of power and an incredible 760 Nm of torque. The Audi Q7 3.6 petrol can accelerate from 0 to 100 in 8.5 seconds. Top speed for the Audi Q7 is 210 km/h in the 3.0 TDI, 230 in the 3.6 petrol, 236 4.2TDI and a breathtaking 244 km/h in the 4.2 petrol. And all this is at my control via the six-speed tiptronic transmission with DSP and sport program, and steered by the speed sensitive power steering. That’s almost scary. Four wheel drive capacity and ground clearance? Well, the word “Quattro” has indicated an Audi four wheel drive for a long time, and is probably what the Q in Q7 stands for. The ground clearance, while you can’t quite squeeze underneath the Audi Q7 without a jack, is certainly good enough to get me over most roads I would care to drive down. Comfort, good sound system, bells and whistles? Again the Audi Q7 has the goods. I certainly wouldn’t be disappointed with the 11-speaker CD player system, and the deluxe automatic air conditioning sounds perfect to me (and I’d take the heated front seats as an option). The MMI with a 7 inch colour monitor makes a useful technological addition, as does the DVD based navigation that comes as standard in the Audi Q7 4.2. OK so that’s the end of this Audi Q7 review! Everything ticked on the list. Now where’s the nearest dealer? For any more information on the Audi Q7, or for that matter reviews or prices on any other new car, you can contact one of our friendly consultants on 1300 303 181. If you’d like some fleet discount pricing (yes even for private buyers! ), we can submit vehicle quote requests out to our national network of Audi dealers and come back with pricing within 24 hours. Private Fleet – car buying made easy!